The most recent statistics from the immigration office reveal Germany has accepted nearly 170,000 asylum seekers this year. It has also rejected approximately 210,000, however nearly half of those decisions have been appealed and about 25 percent of them have been overturned., writes Time magazine (Subscribe now). 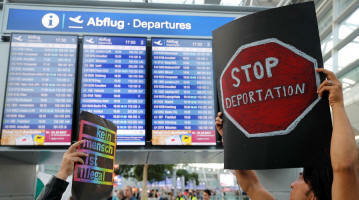 Pilots in Germany are refusing to deport rejected asylum seekers, leading to the cancelation of more than 200 flights. A freedom of information request revealed that 222 scheduled flights were forced to be canceled over the course of 2017 as pilots refused to play a part in returning people to Afghanistan, which is still reeling from years of occupation by Western forces. Deutsche Welle reports that 140 of the canceled flights were to take off from Frankfurt Airport, which is the largest in the country. Dusseldorf Airport, where activist groups regularly hold demonstrations against deportation, saw 40 flights canceled.